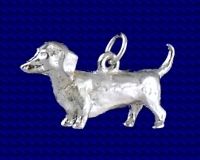 Sterling silver Dachshund charm. There does not seem to be any consensus between experts on how the Dachshund originated. Several different breeds have been named as their ancestors. What is agreed is that the Dachshund originated in Germany and that they were used for hunting badgers and other small mammals.The Dachshund has been a favourite of many famous people including Queen Victoria. 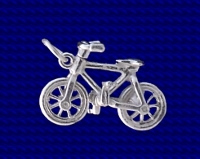 Craftsman made Sterling silver Dachshund charm. Approx. size 13mm x 24mm.